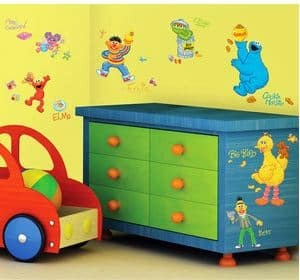 Sesame Street Peel & Stick Wall Decals Only $8.35! If your little one loves Sesame Street then these adorable Sesame Street Peel & Stick Wall Decals at Walmart would be a great addition to their room, plus at only $8.35 (regularly $13.00) they are a great value. Choose store pick-up and avoid shipping fees completely or have them shipped to you for only $0.97! Stickers include Elmo, Bert, Ernie, Big Bird, Cookie Monster, Abby Cadabby, and Oscar the Grouch plus MORE! There are over 30 stickers total.